Eating disorders are some of the most deadly mental health conditions in the world. An untreated eating disorder can lead to severe nutritional deficiencies, infections, organ failure, and death. Unfortunately, an eating disorder can increase the chances of a sufferer turning to drugs or alcohol for relief. The rate of SUD with co-occurring eating disorders is as high as 50%, and people with eating disorders are also five times as likely as the general population to engage in problem drinking behaviors or experiment with drugs or alcohol. A mental health condition like anorexia or bulimia is a lifelong condition, the same as substance use disorder. Patients need ongoing care and comprehensive, tailored support for treatment for both conditions to be successful. An eating disorder is a psychiatric condition wherein the patient exhibits disordered and dangerous thinking and behaviors around food. They may intentionally starve themselves, compulsively overeat, or eat and then force themselves to vomit. Several eating disorders are recognized in the DSM 5. Perhaps the most recognizable of the eating disorders, anorexia is also one of the most deadly. Patients will intentionally starve themselves, and often have distorted perceptions about their weight and body. Even when an anorexia sufferer is dangerously underweight, they may still view themselves as overweight. People with anorexia often exercise compulsively to the point of injury and take laxatives as a way to purge themselves of calories. Anorexia as a child or adolescent can cause lifelong health problems, including a depressed immune system, anemia, and bone loss. People with bulimia have distorted perceptions about their weight. To lose weight, they will binge eat, and then force themselves to vomit. Bulimia can cause lifelong heart problems, tooth decay, esophageal erosion, gum disease, hair loss, and stroke. Patients with binge eating disorder will compulsively eat until they are so full that they may make themselves sick. People with this condition are overweight or sometimes morbidly obese. Excess weight causes a wide range of long-term health problems, including diabetes, arthritis, heart disease, high blood pressure, and depression. 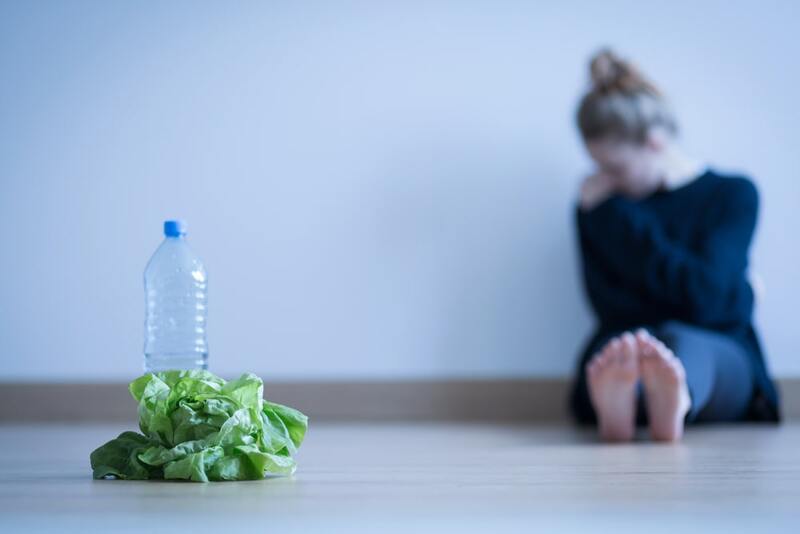 These most common eating disorders affect millions of people in the U.S, and women between the ages of 12 and 35 are the most likely to have an eating disorder. Women are more likely to have anorexia or bulimia than men, and men are more likely to have binge eating disorder. In young men, excessive exercise, weight lifting, and extreme dieting are the more common symptoms of anorexia or bulimia. Unfortunately, eating disorders rarely occur in isolation. Often, a person with an eating disorder also suffers from other psychiatric conditions. The most common co-occurring disorders are depression, anxiety and panic attacks, OCD, and drug or alcohol abuse. As is most often the case with psychiatric disorders and SUD, there is no singular cause. However, there are a few known risk factors that can increase the chances of an individual developing an eating disorder. Having a family member with an eating disorder. Being exposed to eating disorders within a peer group. Undiagnosed or untreated mental health disorders. Being exposed to societal pressures to be thin or muscular. Studies have found that people with certain personality traits might be more susceptible to developing an eating disorder. Research has found that a few of the genes that are known to play a role in eating disorder development are also associated with certain personality traits that may make a person more susceptible to the disorder. These traits may be heritable, and are also thought to exist before the development of the disease, and can persist even after a person initially recovers. Learning how to control these traits, and learning how to cope and manage distressing emotions in therapy is imperative for treating an eating disorder. What drugs are people with eating disorders most likely to abuse? People with anorexia and bulimia are more likely to abuse drugs or alcohol than people with binge eating disorder. Studies on eating disorders have found that people who abuse drugs or alcohol are nearly eleven times more likely to have a current or past eating disorder. A total of 50% of eating disordered individuals who enter a hospital or psychiatric treatment centers are also addicted to drugs or alcohol. Research on teen girls has found that teens who believe they are overweight, whether it’s clinically accurate or not, are at high risk of developing an eating disorder and substance use disorder. Statistically, only about 15% of female children and adolescents are overweight, but up to 60% of the girls are trying to lose weight. Girls who are frequently dieting are almost four times as likely to become smokers. People with eating disorders often abuse inhalants and cocaine. Up to 12.6% of high school females take diet pills or supplements to control their weight without consulting a doctor. People with bulimia and alcohol addiction are at high risk of suicide attempts, anxiety, and personality disorders than bulimic patients who are not addicted to alcohol. Teen girls of Hispanic descent are the most likely to abuse laxatives in a bid to lose weight. Gay and bisexual men and boys are at increased risk for eating disorders and co-occurring substance abuse. Eating disorders and substance abuse are severe conditions that if left untreated, can significantly impair a person’s long-term health and even cause premature death. Medical detox, rehab, and customized therapy sessions are useful for treating and managing the symptoms of these complex disorders. Are you or a loved one exhibiting the signs of an eating disorder along with drug or alcohol addiction? The therapists and doctors at Windward Way have helped thousands of people recover from eating disorders and achieve sobriety. It ’s never too late to reach out for help. Please contact Windward Way today to explore your options for dual diagnosis treatment.